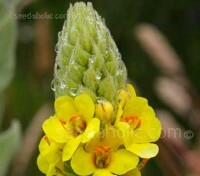 One look at this species of Verbascum and you will realise why it is also called ‘Arctic Summer’. 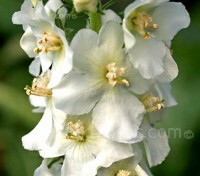 Tall, white, fleecy flower stems emerge from felted evergreen leaves in early summer. 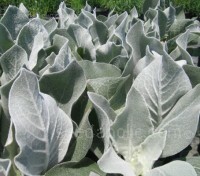 Its stems and leaves are covered in a silvery down that gives it an appearance of being permanently covered with frost. 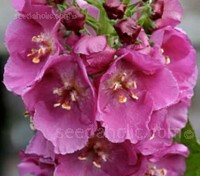 Verbascums are statuesque in both foliage and flower. 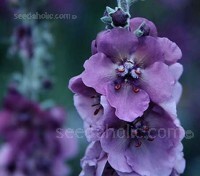 This elegant species, native to the Olympus mountains is arguably the finest of the genus. 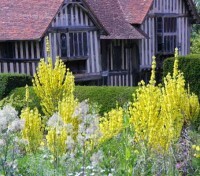 Tall flower spikes rise from the centre of the foliage, each are weighted heavily with bright, golden-yellow blooms giving the effect of an enormous candelabra.